We offer a range of attractive finance packages range from 12 months up to 60 months through our partner Divido. No paper forms. No sending forms in the post. Completely online. The process is simple and takes around 5 minutes to complete. The process is carried out online and you will receive a decision within 30 seconds of completion. Whether you’re buying your first sewing machine, or upgrading your current model, why not make budgeting for it a little more flexible? £92.08 per month for 36 months at 9.9% APR Representative – total payable £3634. Feel free to give us a ring on 0121 444 3978 or send us an email to info@franknutt.co.uk and we would be happy to answer any questions you might have. Frank Nutt Sewing Machines LTD is a non-independent credit broker. Frank Nutt Sewing Machines LTD has access to a lenders as a non-independent credit broker. Finance available subject to credit acceptance to UK residents aged 18 or over. Guarantees and indemnities may be required. Terms and conditions apply. Offer may be varied, withdrawn or extended at any time. All figures are correct at time of publication but may be subject to change. What does this mean? Essentially, we're non-independent because we only work with a single finance provider and cannot search nor advise on the whole market for your best option to fit your circumstances. What's a credit broker? We make an introduction on your behalf to a lender, but we are not the lender itself. Meaning for example, when you take out finance on a new product, we introduce you to Divido (the lender) and your finance agreement is between you and them. What about fees? We don't charge you a fee for an introduction to a lender, however the lender may pay us or charge us a fee for the introduction. How am I scored? Different lenders have different methods of scoring you for your suitability of your finance application. We are not privy to the score, nor how they arrive at it. We only get notification of an acceptance, referral or decline. If you want to speak to our finance provider, their details are below. My credit score isn't good, and I've been refused finance before. We don't currently work with any lenders who specialise in finance for those who find themselves with an adverse credit record. Please consider carefully any agreement where the total amount payable and APR are significantly higher than those offered through our chosen lender. Please be aware that all credit searches are recorded against your history and may adversely affect your credit score. Frank Nutt Sewing Machines Ltd is authorised and regulated by the Financial Conduct Authority (FRN 803615) and acts as a credit intermediary. Finance options are provided by Divido Financial Services Limited in association with Shawbrook Bank Limited who is authorised by the Prudential Regulation Authority and regulated by the Prudential Regulation Authority and the Financial Conduct Authority. Registered office: Lutea House, Warley Hill Business Park, Great Warley, Brentwood, Essex, CM13 3BE. Finance available subject to age and status. Terms and conditions apply. Frank Nutt Sewing Machines LTD 17-23 Poplar Road, Kings Heath, Birmingham, B14 7AA. OPTION 1 – Interest free credit, for 12 months with no deposit 0% APR Representative. Finance is available on all orders between £599 and £50,000. Brother Sewing Machines can offer you interest free finance from Barclays Partner Finance. 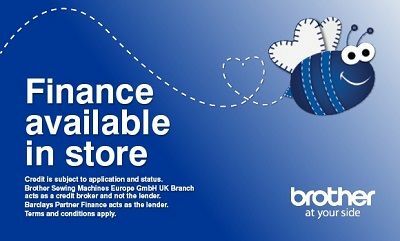 Finance is available on selected machines in store; you could pay with monthly finance. If you would like to apply for finance, please visit the shop or call us on 0121 444 3978 to talk you through the available monthly finance plans and process your application in minutes. Brother Sewing Machines Europe GmbH UK Branch acts as a credit broker and not the lender. Barclays Partner Finance acts as the lender. Terms and conditions apply. To apply for finance please call us on 0121 444 3978. OPTION 2 – Interest free credit for 18 months with no deposit 0% APR Representative. Finance is available on all orders between £1,500 and £50,000. Brother Sewing Machines can offer you interest free finance from Barclays Partner Finance. Finance is available on selected machines in store; pay with monthly finance instalments. If you would like to apply for finance, please visit the shop or call us on 0121 444 3978 to talk you through the available monthly finance plans and process your application in minutes.